How to put YouTube/Dailymotion Videos on any Post, quote or topic. 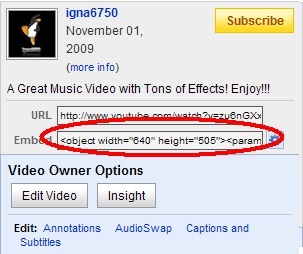 Hi, I'm Igna6750plusCP and I'm gonna show you how to Put Dailymotion/YouTube Video on any Topic, Post or Quote. 1.- Write whatever you want in the post until you want to put on your YouTube/Dailymotion Video. 6.-Press Ok and Send the Topic! 5th Administrator or SG08 Forums. i like being the forums staff is so fun thats why im always active and working or posting. ya being staff is awsome! being an admin was so much easier then i thought! Hello Guest you rock!! keep posting!!!!! Ikr? I love being staff! That's why I mae my own forums, an it has been INCREIBLY fun!!! PS: Ikr means "I Know right"
umm dude, o you plan on changing any other things on your forums? anwyays, let's get back on topic. hmm..maybe ill make a beta sig..but i need votes first...and maybe a bg for the forum......and we need to make some topics! but, are you gonna change the buttons? the main design of your forums? Subject: Re: How to put YouTube/Dailymotion Videos on any Post, quote or topic.